This sign has appeared outside our flat. Is it really necessary? 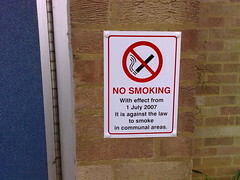 I don't remember anyone ever smoking in the public part of our flat building. It is a damn ugly sign - and they've not even fitted it level! So this sign has to go at the entrance to every public building?! I'm all for the smoking ban - but this is just ridiculous. Typical UK, only we could take a great idea, and still manage to get some ridiculous rule out of it. Even churches will have to have signs!